Dear CNN: Census Confirms 63 Percent Of 'Non-Citizens' Are On Welfare -- Is THAT News? Dear CNN: Census Confirms 63 Percent Of ‘Non-Citizens’ Are On Welfare — Is THAT News? The President has proposed new ‘public charge’ rules that would expand the list of services that would be considered welfare programs. Benefiting from such programs may prevent immigrants from obtaining lawful permanent residence (ie. a green card). You can just imagine the spittle-flying outrage from the leftists on this. Despite the critics, the President is addressing a real issue that they refuse to acknowledge — the massive public cost of non-naturalized immigrants in America. According to the 2010 census, 63 percent of ‘non-citizen’ households are receiving some form of welfare, and that number goes up 70 percent after 10 years, which means that once they start receiving benefits, they don’t get off of them. These numbers are vastly higher than the 35 percent of citizen households accessing at least one welfare program. Of non-citizens in Census Bureau data, roughly half are in the country illegally. Non-citizens also include long-term temporary visitors (e.g. guestworkers and foreign students) and permanent residents who have not naturalized (green card holders). 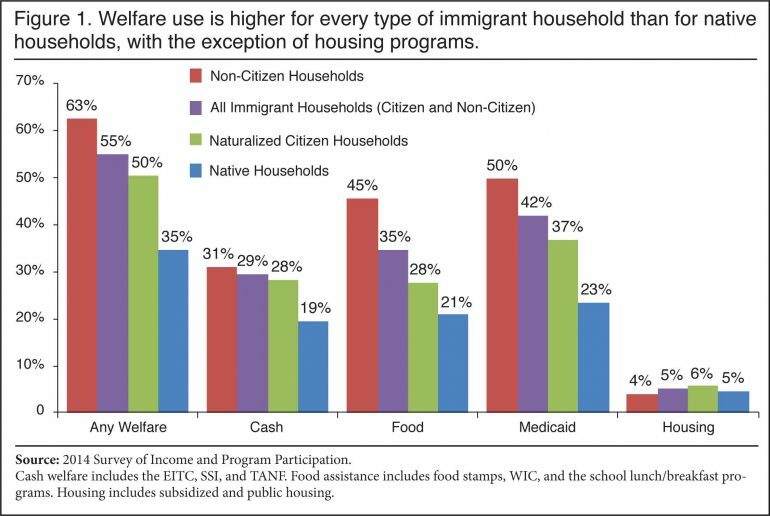 Despite the fact that there are barriers designed to prevent welfare use for all of these non-citizen populations, the data shows that, overall, non-citizen households access the welfare system at high rates, often receiving benefits on behalf of U.S.-born children. The report also found that there are certain programs that are accessed by non-citizens at a higher rate than native citizens. Compared to native households, non-citizen households have much higher use of food programs (45 percent vs. 21 percent for natives) and Medicaid (50 percent vs. 23 percent for natives). This isn’t just about people crossing the border, this data includes legal immigrants. And nearly all, 4,370,385, have at least one worker in the house. In their report, Steven A. Camarota, the director of research, and Karen Zeigler, a demographer at the Center, said that in census data, about half of those are in the United States illegally. 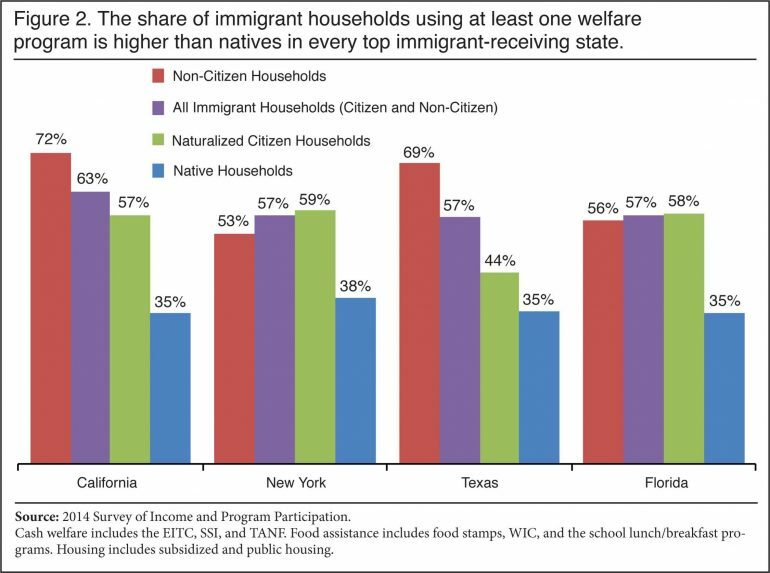 While legal immigration is a great thing, there is obviously a problem when immigrants, 10 years later, are accessing welfare programs at double the rate of native citizens. The United States is supposed to be ‘the land of opportunity’, not a welfare state. We desperately need immigration reform as well as welfare reform — and we need to be able to discuss how they are related without being called racist for suggesting that perhaps we shouldn’t be handing over tax dollars to non-citizens for decades ‘just because’. It’s time to have a discussion about how to stop this dependence on the public dime. Analysis by the Center for Immigration Studies of the Census Bureau’s Survey of Income and Program Participation (SIPP) shows welfare use by households headed by non-citizens is very high. The desire to reduce these rates among future immigrants is the primary justification for the rule change. Immigrant advocacy groups are right to worry that the high welfare use of non-citizens may impact the ability of some to receive green cards, though the actual impacts of the rules are unclear because they do not include all the benefits non-citizens receive on behalf of their children and many welfare programs are not included in the new rules. As welfare participation varies dramatically by education level, significantly reducing future welfare use rates would require public charge rules that take into consideration education levels and resulting income and likely welfare use. We need entrepreneurs, hard workers, and those with degrees that have special skills. We can’t continue to permit non-citizens to belly-up to the public trough and park themselves there for decades and leave citizens to pay the bill. That math just doesn’t work long-term and we need to fix it as soon as possible. Good on President Trump for tackling this issue despite the backlash! 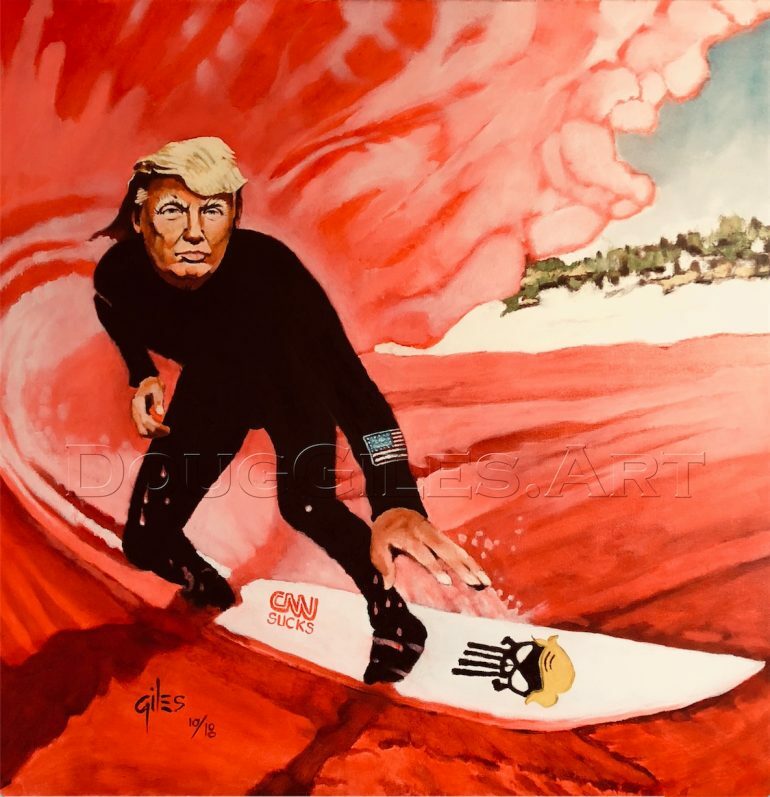 Even the most hopelessly landlocked Trump fan can unleash their ‘inner surfer’ with this one! There is no question, Trump is the ‘Big Kahuna’ of politics. News network can’t go two stories without bringing his name into the conversation one way or another. He is, once again defying all political odds, and is whipping up strength down-ticket on the Mid-terms. He stuck to his guns over Kavanaugh and convinced the Senate to do the same, and the polls are showing it! Not long ago, the Media(D) were excitedly chattering about a blue wave. Then the gap narrowed. A bright red wave. It captured his Don’t GAF style nicely. The art on his board is a nice touch, too. Get your own print today.